Early Sunrise Coreopsis | Gurney's Seed & Nursery Co. 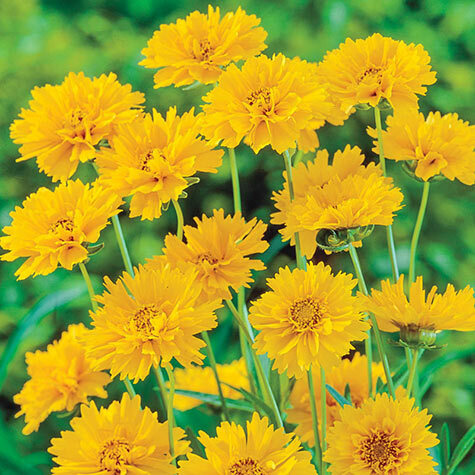 Being one of the earliest Coreopsis to bloom and one of the easiest perennials to grow, it's no wonder this butterfly favorite was an All-American Award Winner! Wonderful for fresh bouquets, plant with Echinacea, Hummingbird Mint and Salvia for a beautiful mix of colors and textures in your summer garden. Bareroot. Zones 4–9. Depth: Plant the crown(where roots meet together) 1 inch below soil surface. Blooms: June through frost, if dead-headed continuously. Flower Form: Semi-double, approximately 2 inches. Soil Requirements: Well-drained soil is important. If too rich, stems will flop over. Pruning: Dead-head. Cut stems back once blooms have finished. Comments: Profuse flowering, the tallest of the coreopsis. Larger flowers held on tall sturdy stems. Covers itself with bright flowers. Once established, sprinkle 10-10-10 fertilizer in early spring when new growth begins. Remove spent flowers to encourage more blooms. Divide in spring when desired. Hardy to -20 degrees F. Butterflies are attracted to this flower.